The global healthcare information systems market depicts the presence of a highly competitive and fragmented vendor landscape, says Transparency Market Research on the basis of a newly published report. Such a competitive scenario is mainly present due to the existence of innumerable small, mid, as well as large-scale players in the market. In 2015, the large-scale players comprised about 26% of the total market shares. Most companies operating in the global healthcare information systems market are implementing key strategies such as mergers and acquisitions in order to thrive over here. Apart from this, the players also are concentrating on improving their product portfolios as well as bring forth product diversification in order to create a niche of their own in the global healthcare information systems market. Medidata Solutions Inc., GE Healthcare, Athenahealth Inc., Siemens Healthineers, McKesson Corporation, Allscripts Healthcare Solutions Inc., and NextGen Healthcare Information Systems LLC, are some of the key companies present in the healthcare information systems market from a global perspective. Statistically speaking, expert analysts predict the market to register revenue worth US$448 bn by the end of 2024. 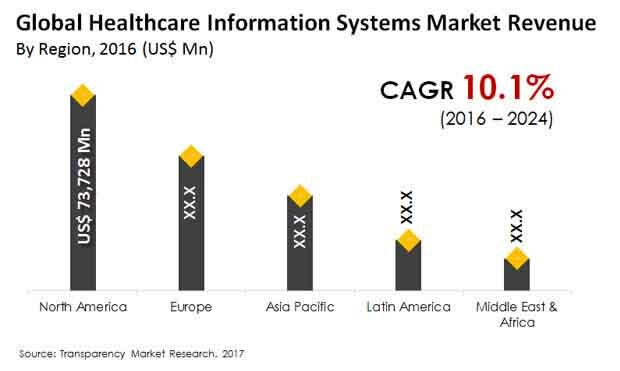 This indicates a splendid growth as compared to an earlier revenue figure of US$192 bn registered by the global healthcare information systems market in 2015. Such a fantastic progress is prophesized to occur at a splendid CAGR of 10.1% during the forecast period from 2016 to 2024. With an increasing amount of information about patients admitted in different healthcare centers being collected, a dire need for sorting out the relevant data exists, thereby driving the global healthcare information systems market. This is mainly due to the presence of these systems playing a crucial role in properly organizing the data collection and storage-based processes. In addition, with rapid digitization of overall healthcare equipment, the use of specific information system has witnessed a notable surge, thereby driving growth in the global healthcare information systems market. Moreover, these systems are highly preferred as they help increase accuracy and decrease the chances of human errors. Such systems also help bring down costs by reducing requirement of performing manual paperwork and human labor in the long run. However, steep initial capital is needed to setup quality healthcare information systems. This might make it difficult for businesses having less capital to get properly established in this market. Moreover, high maintenance costs of these systems is also likely to impede growth in the market in the long run. In addition, these systems might not be readily available in remote and underdeveloped regions, thus restraining the market from a geographical perspective. Nonetheless, many players are working towards regulating costs of their products, thereby offsetting most restraints affecting the market.